The frigid expanse of land at the Earth’s Southern pole is covered by 90 percent of the planet’s ice. If all the ice in Antarctica’s ice sheets were to melt, it would raise sea levels by 190 feet. Much of this ice is miles thick and still frozen solid. But a hotter atmosphere and a warmer ocean have caused some of it to melt at an increasingly faster rate. An international team of 80 researchers reported in June that the rate of thaw in Antarctica has tripled over the past decade. The study, published in the journal Nature, showed that Antarctica lost a total of 2.71 trillion metric tons of ice between 1992 and 2017. 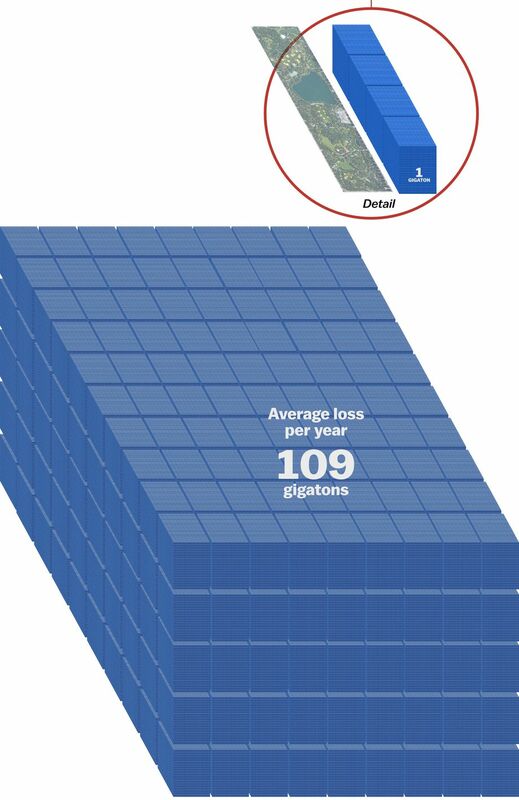 Half of these losses came in the past five years. The researchers came up with these numbers by using satellite measurements of ice sheet mass balance, a collaboration between the European Space Agency and NASA called IMBIE. The study is one of the most robust efforts ever to measure changes in Antarctica, and its findings are an unnerving example of the consequences of a warmer ocean. According to the research team, the rate of ice loss has accelerated to 219 gigatons per year between 2012 and 2017, a bit more than the peak flow rate of Niagara Falls. That’s 219,000,000,000 metric tons. Understanding the rate of ice melt way down in Antarctica is incredibly important for global sea levels. Continuing on this trajectory means transforming every coastline and every seaside community on earth. But how do you even wrap your mind around a number that large? For the 25-year period between 1992 and 2017, Antarctica lost an average ice mass of 109 gigatons per year. 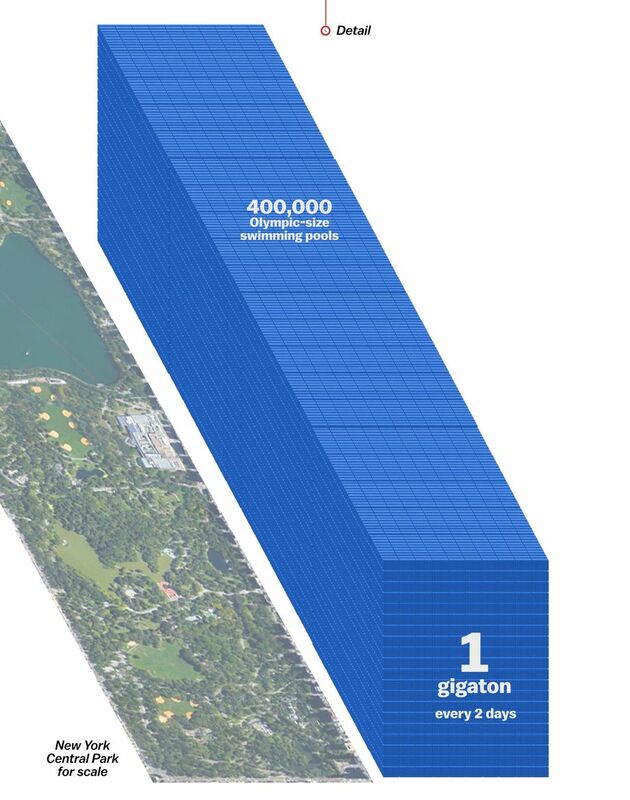 That adds up to 2,710 gigatons of ice turned into water between 1992 and 2017 (get ready to scroll). This year, we’ve also seen a heat wave in the Arctic and the fastest decline in Arctic sea ice in 1,500 years. But it’s important to note that the ice in Antarctica is different from the ice in the far north, with different consequences for the planet. Much of the ice in the Arctic is sea ice made of frozen ocean. Its extent changes with the seasons, and it’s only a few meters thick at most. It can alter atmospheric air currents, but it has a negligible impact on sea levels. Antarctica’s ice, on the other hand, sits on top of a land mass. It is formed by precipitation over millions of years, and is upward of 3-miles thick in its thickest spots. Since it’s not in the water, Antarctic ice raises global sea levels when it melts. Given the Brobdingnagianamount of ice it houses, a melting Antarctica has the potential to submerge coastlines around the world. 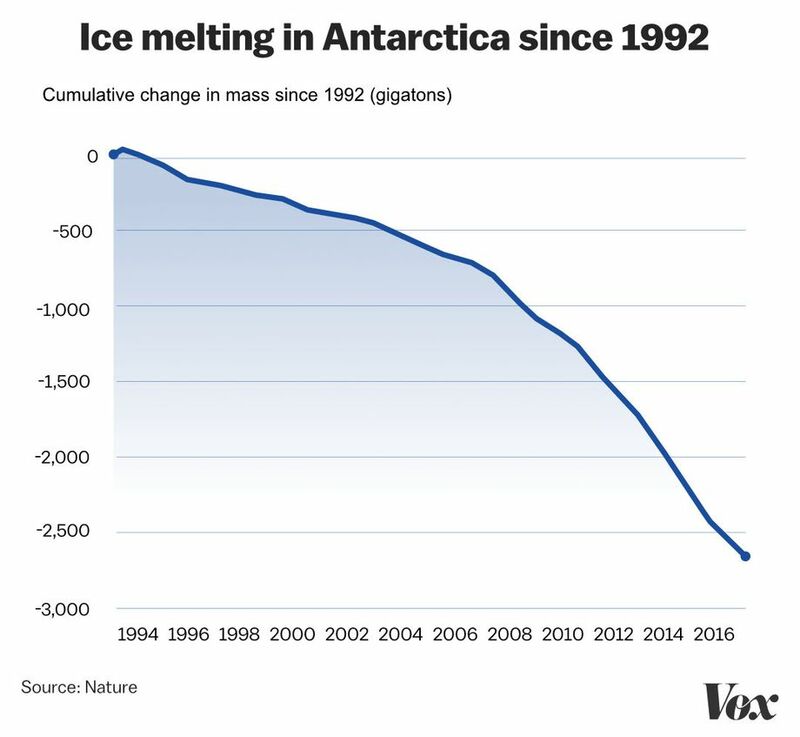 What’s clearer now is that Arctic and Antarctic ice are are experiencing declines, and the rate of ice melt in Antarctica is speeding up. Researchers are preparing new satellite missions to measure the ice before it goes away. At the same time, storms are becoming more intense, and more people are living in coastal areas. So property developers in Miami should keep a close eye on the South Pole, lest an inland condo building suddenly find itself on a beach front.